General George C. Marshall shaped the wartime U.S. Army and advised President Franklin D. Roosevelt throughout World War II. President Franklin D. Roosevelt was disturbed in the autumn of 1938 by the Munich agreement, at which the rights of Czechoslovakia were signed away, and by reports of mounting air strength in Adolf Hitler’s Nazi Germany. Shortly after the infamous accord on September 29, the president instituted a series of White House meetings at which he and his military advisers discussed the ominous situation in Europe. One of the early formal sessions was attended by the Assistant Secretary of War, the Solicitor General, the Secretary of the Treasury, the Army and Air Corps Chiefs of Staff, and a tall, blue-eyed, and courtly brigadier general named George C. Marshall, who had recently been appointed the Army Deputy Chief of Staff and head of the War Plans Division. FDR unveiled an ambitious program for building 10,000 military aircraft a year with no increase in supporting forces. As the proceedings drew to a close, the president summed up his plan and turned to Marshall, whom he scarcely knew. “Don’t you think so, George?” he asked. Marshall replied, “I am sorry, Mr. President, but I don’t agree with that at all.” The general was painfully aware of the state of America’s defenses and knew that it would require much more than airplanes to rectify the situation. The U.S. Army, numbering only 174,000 men, was ranked 19th in the world, just behind that of tiny Portugal. Roosevelt gave a startled look, and the outspoken Marshall received expressions of sympathy from the other conferees, who feared that his promising tour of duty in Washington was about to come to a swift end. But they underestimated both the president and the general, and stiff formalities were observed. FDR never again called Marshall “George” in public, and the general always called FDR “Mr. President.” He refused to succumb to the well-known Roosevelt charm and determined never to laugh at his jokes. On April 23 (St. George’s Day), 1939, FDR made one of the most significant choices of his presidency. Vaulting over 34 names on the senior generals’ rank list, he asked Marshall to succeed retiring General Malin Craig as Army Chief of Staff. In a hasty ceremony at the old Munitions Building in the nation’s capital, Marshall took the oath of office on Friday, September 1, 1939, the day that Germany invaded Poland and World War II began. He was promoted automatically to four-star rank. 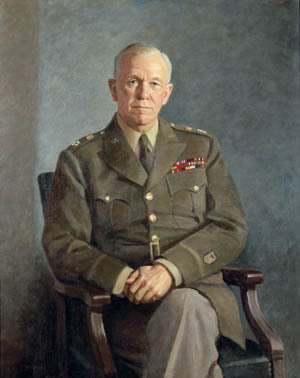 Wearing the five stars of General of the Army rank, U.S. Army Chief of Staff George C. Marshall sat for this portrait following the end of World War II. Marshall went on to serve as U.S. Secretary of State and formulate the Marshall Plan to rehabilitate warravaged Europe. Enthusiasm and resources for a large army were lacking. Instead of 800 men, many infantry battalions could muster only 200, including clerks and cooks, and equipment was hopelessly obsolete and inadequate. Marshall was no interventionist, but it was his responsibility to prepare the Army for a modern war. Despite opposition from the Navy, the Air Corps, isolationists, Congress, and even the president, Marshall went to work with decisiveness and often drastic moves. He gave his best effort. Marshall set out early to reorganize the War Department, where the thinking and bureaucracy had advanced little since 1919. He sought to create “some kind of organization that would give the chief of staff time to devote to strategic policy and the strategic aspects and direction of the war.” There were too many people reporting to him, and too many forced to approve too many documents before the War Department shambled into action. The major change was the elimination of the fiefdoms of the major generals commanding the infantry, cavalry, field artillery, and coast artillery, each of whom jealously guarded his service branch and personal prerogatives. Marshall was intent on creating a unified, efficient army rather than a loose collection of separate services. The reorganization was undertaken by a committee headed by blunt, ruthless Maj. Gen. Joseph T. McNarney, a former Air Corps pilot. Efficiency was stressed, and the men immediately below Marshall were given increased authority. Instead of 60 officers having access to the chief of staff, the plan reduced the number to six. Nevertheless, Marshall often plumbed the lower ranks to hear from younger men with worthwhile ideas. The new Army was made up of three commands—the Ground Forces, led by the bantam, energetic Lt. Gen. Lesley J. McNair, Marshall’s longtime friend from World War I; the Services of Supply, under Lt. Gen. Brehon B. Somervell, a hard taskmaster; and the Army Air Forces, commanded by genial Lt. Gen. Henry H. Arnold. For his command post, Marshall reorganized the War Plans Division and renamed it the Operations Division. While undertaking the massive reorganization, Marshall also found time to institute another reform in America’s military command structure. His plan to reorganize the Joint Chiefs of Staff proved to be one of his most enduring achievements. Marshall worked closely with his immediate civilian superior, Secretary of War Henry L. Stimson, and managed to cultivate a good relationship with Admiral Ernest J. King, the irascible Chief of Naval Operations, despite fierce Army-Navy rivalries. Marshall gained the cooperation of Congress and worked harmoniously with President Roosevelt, though in temperaments and habits they were oddly matched. After harboring doubts about him until the Pearl Harbor attack, the austere general came to trust and respect FDR for his intelligent, decisive leadership. “It took me a long time to get to him,” Marshall noted. George Catlett Marshall was born in Uniontown, southeast of Pittsburgh, Pennsylvania, on Friday, December 31, 1880, the youngest son of a stern, prosperous coalfield owner, Democrat, and Episcopal vestryman. Nicknamed “Flicker,” the gangling, red-haired boy became fascinated with local history, but his progress in school was indifferent. Sensitive and shy, he floundered in grammar, spelling, and mathematics and was an average student in everything but history. Benjamin Franklin and General Robert E. Lee were his early heroes. Unlike many of those high-ranking military officers who reported to him, Marshall attended the Virginia Military Institute, not West Point. 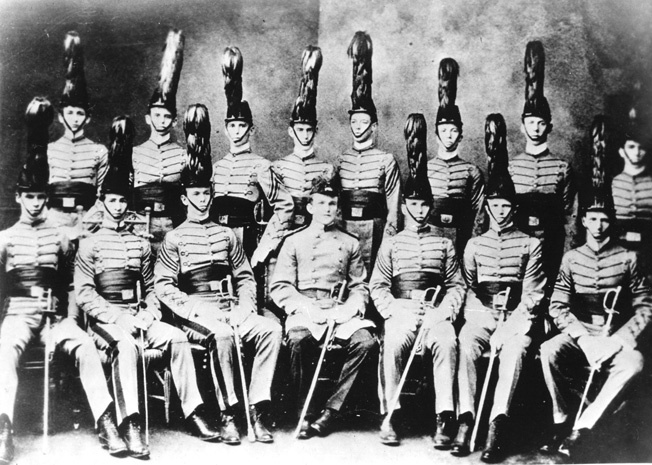 In this photo, Marshall is shown front row center with other VMI cadets in 1901. Young George decided on a military career, and the Virginia Military Institute was the first choice because several Marshalls had attended the school. His grades remained unimpressive, but the young man mastered drill regulations and enjoyed exercising command. He grew into a model cadet and advanced from first sergeant to first captain. Meanwhile, he courted a 26-year-old woman who would become his wife—auburn-haired, shapely Elizabeth “Lily” Carter Coles of Lexington, Virginia. Graduating from VMI in late 1901, Marshall received his commission as a second lieutenant in January 1902 and was assigned to the 30th Infantry Regiment stationed in the Philippines. After a hasty marriage and brief honeymoon with Lily that February, George kissed her goodbye and headed for a remote, dismal Army post on Mindoro Island. At the end of 1902, Lieutenant Marshall and his company were transferred to bustling Manila, where he borrowed cavalry mounts and took up riding, which would become his lifelong recreation. Marshall was posted back to the United States in November 1903, and served at Fort Reno in the Oklahoma Territory. He was promoted to first lieutenant in 1907 and graduated that year from the Infantry and Cavalry School at Fort Leavenworth, Kansas. He graduated from the staff college there in 1908, and remained as an instructor until 1910. Flicker Marshall’s career got into gear when America entered World War I in April 1917. That July, he went to France as a staff and operations officer with Maj. Gen. William L. Sibert’s 1st Infantry Division. Marshall quickly showed a flair for staff work and leadership, and the experience prepared him for his considerable role in the later world war. Promoted to temporary colonel in August 1918, Marshall moved up to the staff of the U.S. First Army. The following month, he accomplished a brilliant feat of staff work by overseeing the rapid night movement of 500,000 troops, 2,700 guns, and 40,000 tons of ammunition from St.-Mihiel to the Argonne Forest for the big Meuse-Argonne offensive. Marshall continued to move upward in the Army hierarchy, gaining recognition as a first-rate staff officer and trainer. He was appointed operations chief of the First Army in October 1918, chief of staff in the Eighth Corps the following month, and served as an aide to Pershing in 1919-1924. Pershing championed Marshall’s career and later directly petitioned President Roosevelt to consider him for Army Chief of Staff. After having reverted to the rank of captain, Marshall was promoted to major in 1920 and lieutenant colonel in 1923. He served with the 15th Infantry Regiment in China in 1924-1927, and then was named assistant commandant of the Infantry School at Fort Benning, Georgia, where he left a strong imprint on the tactics the Army would use in World War II. Promoted to colonel in 1933, Marshall commanded the 8th Infantry Regiment at Fort Moultrie, South Carolina, served as senior instructor of the Illinois National Guard, and was promoted to brigadier general in 1936. Two years later, he was attached to the Army General Staff. 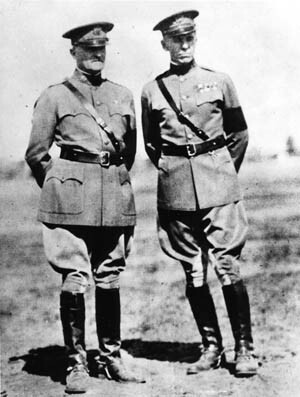 As a young officer with the temporary rank of colonel, Marshall served as an aide to General John J. Pershing in France during World War I. Although he had never commanded a division or been in action, Marshall proved to be the ideal man—intelligent, resolute, and widely respected—to build and lead the Army when his unready nation was thrust into global war. He assumed Pershing’s mantle as America’s premier soldier. Marshall inspired and guided almost every aspect of the Army’s growth and effectiveness —recruitment, mobilization, training, logistics, commissions, racial problems, utilization of women, and morale, one of his primary concerns. He traveled widely, usually by air, from camp to camp to check on conditions and needs. He moved without parades or other ceremonies and made morale a “command responsibility.” He also went in civilian clothes to visit the towns near large bases. Marshall respected officers with initiative who did not wait to be told what to do and encouraged them to disagree with him when necessary. He insisted on concise briefings, sought to “expunge ponderosities,” used telephones sparingly, and instituted 9 am show and tell sessions that kept him on top of military and political situations around the world. Marshall remained a firm believer in staff initiative. One day early in 1941, he was conferring with some generals when then Major Walter Bedell Smith came in to report the plight of a salesman who was being given the runaround in Washington. His company had designed a small, lightweight, low-silhouette vehicle that could carry four or five soldiers and be lifted out of mudholes by its passengers. The blueprint had been rejected by the Ordnance Department, but, from his days as an instructor under Marshall at the Infantry School, Smith believed that such a vehicle could be useful to the Army. “Well,” asked the chief of staff, “what do you think of it?” Smith replied, “I think it is good.” Marshall responded crisply, “Well, do it.” And that was how the durable quarter-ton jeep entered Army service, used for myriad functions in all theaters of operations during the war. By the end of 1945, a total of 653,568 jeeps were in service—634,000 delivered to the Army and almost 20,000 to the Allies and the other services. So Marshall screened the roster of senior generals to see who could lead an army or corps in combat and eliminated all except the gallant German-born Walter Krueger, who would lead the Sixth Army with distinction in the Pacific War. Meanwhile, the chief of staff compiled a list of officers—some known to him and some recommended—in whose judgment he had confidence. The names in his “little black book” included Dwight D. Eisenhower, Omar N. Bradley, Mark W. Clark, Courtney H. Hodges, Jacob L. Devers, George S. Patton, Jr., J. Lawton Collins, Alexander M. Patch, William H. Simpson, Lucian K. Truscott, and Robert L. Eichelberger. 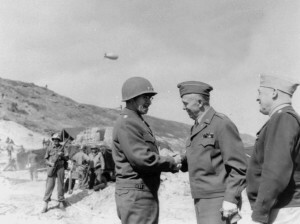 commander of the U.S. First Army in Normandy in June 1944. Bradley was later elevated to command of the Allied 12th Army Group. These men achieved distinction, but Marshall was not infallible in his choices of fighting generals. He overlooked the able James Van Fleet, and three of his chosen corps commanders had to be relieved—Lloyd R. Fredendall after the Kasserine Pass rout, Ernest J. Dawley after the near disastrous Salerno invasion, and John Millikin after the Rhine River crossing at Remagen. Under Marshall’s wise leadership, the U.S. Army was shaped into an effective fighting force. By the time it began lining up beside the British to fight the Germans in 1942, its combat strength had increased more than tenfold. The Army grew from 1.8 million men in December 1941 to 8.25 million by the war’s end. Marshall enjoyed a cherished relationship with Field Marshal Sir John “Jack” Dill, head of the British Joint Staff Mission in Washington, and when the latter died in November 1944, Marshall skirted regulations to enable him to be buried in Arlington National Cemetery. Dill and Maj. Gen. Orde C. Wingate are the only British officers to be laid there. But Marshall and the British clashed over strategy a number of times during the war. He had proved himself a brilliant organizer but was less sure footed in his approach to the most important strategic choice facing America in World War II: when and where to deploy U.S. forces on a large scale. He correctly supported the Germany first strategic priority, but the timing he proposed was premature and caused serious misunderstandings with the British. He advocated a cross-English Channel invasion in 1942, when manpower and resources, particularly landing craft, were limited, and which, as British Prime Minister Winston Churchill rightly warned, would have been catastrophic. Marshall fiercely opposed the North African campaign and pressed again for an invasion of France in 1943. But manpower and resources were still inadequate, the U.S. Army had still not gained enough experience against the hard-fighting Germans, and the Allies had yet to achieve mastery in the Atlantic and in the skies over Europe. A cross-Channel invasion in 1943 would have carried great military risk. From his Washington desk, Marshall coordinated the operations of American armies around the world, and coordinated these operations with the Navy and the Allied forces. But he was far more than a chair-borne manager of U.S. military resources. He became a leading figure in the U.S. and Anglo-American Combined Chiefs of Staff and attended all the wartime summit conferences. He also visited the armies in the field—from Algeria to New Guinea, from Anzio to Normandy, and from Belgium to Holland—and maintained intellectual and emotional contact with the fighting fronts. Marshall made a special point of talking to subalterns and enlisted men without the presence of their superiors and used liaison officers to prowl the combat zones and report on conditions, needs, and GI morale. The chief of staff viewed war in the same basic terms as General Ulysses S. Grant: go after the enemy and smash him. Marshall’s simple strategy was to mass the maximum possible weight of men, materiel, and firepower against the enemy where he considered success would bring the swiftest and most decisive results. To him, the armed forces’ singular responsibility was total victory. 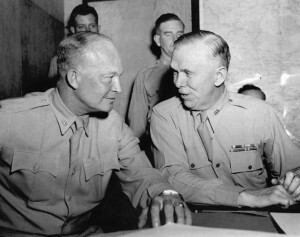 At Allied headquarters in North Africa in June 1943, Marshall (right) confers with General Dwight D. Eisenhower, Allied commander in the Mediterranean Theater. Roosevelt insisted that Marshall should command Operation Overlord but wavered when the moment of decision came. FDR left it to Marshall, who refused to request the post. The president then appointed General Eisenhower, telling Marshall, “Well, I didn’t feel I could sleep at ease if you were out of Washington.” The chief of staff was crestfallen but characteristically never uttered a word of complaint. Marshall saw the great army he had forged mature in combat from North Africa to the Pacific, from the Aleutian Islands to Sicily and Italy, and take its place alongside the British, Canadians, Free French, and Poles in the great crusade across the English Channel on June 6, 1944. After bitter struggles in Normandy and a critical setback in the Ardennes, Marshall’s force vaulted across the Rhine and into the Third Reich as Nazi resistance faltered and then crumbled. The chief of staff was promoted to five-star general in December 1944, and on November 26, 1945, he received his only American military decoration of the war—a second oak leaf cluster to the Distinguished Service Medal he had been awarded in 1919. He had refused U.S. decorations during World War II, saying that it was not proper for him to accept such honors as chief of staff and while men were dying. President Harry S. Truman had reluctantly accepted Marshall’s resignation on November 20, and General Eisenhower became the new Army chief of staff. Marshall was gone from the War Department, returning to his home in Leesburg, Virginia. But his respite was short lived. Late in 1945, Truman sent him to China in a bid to avert a civil war between the Nationalist Kuomintang government and Mao Tse-tung’s Communists. Marshall’s force of character was unsuccessful in bringing about a durable compromise, but the experience proved beneficial when Truman appointed him Secretary of State in January 1947. Marshall resigned his Army commission the following month. Marshall left the cabinet in January 1949, but returned in September 1950 as Secretary of Defense. He held the post for a year during the early phase of the Korean War and retired permanently from public affairs in September 1951. In war and peace, he had given his country sterling service for more than half a century. Marshall acted briefly as President of the American Red Cross and was awarded the Nobel Prize, primarily for his plan for European recovery, on December 10, 1953. The warrior’s health failed, and he was taken to Walter Reed Hospital in the spring of 1959. He suffered a stroke, grew frail, and died quietly on the evening of Friday, October 16. Marshall had left instructions ruling out a state funeral, saying that he wanted no eulogy or long list of honorary pallbearers, and a private interment. On October 20, after a brief, simple service in the Fort Myer (Virginia) Chapel, attended by President Eisenhower and former President Truman, Marshall’s body was taken by caisson to Arlington National Cemetery. He was buried down the hill from the Tomb of the Unknown Soldier as an honor guard fired rifle volleys and taps was sounded. Tags Admiral Ernest King, Adolf Hitler, Alexander M. Patch, Allies, Axis, Blitzkrieg, Cold War, Courtney Hodges, D-Day, Dwight D. Eisenhower, European Theater, Franklin D. Roosevelt, General George C. Marshall, General George S. Patton, General Omar Bradley, General Sir John Dill, Harry S. Truman, Henry L. Stimson, Lesley J. McNair, Lucian K. Truscott, Mark W. Clark, Marshall Plan, Munich Agreement, Nazi Germany, Normandy, north africa, Operation Overlord, Orde Wingate, Pacific Theater, Pearl Harbor, Robert Eichelberger, U.S. Army Air Corps, U.S. Navy, United States Army, United States Marine Corps, virginia military institute, Walter Krueger, Winston Churchill.